You are here: Home / Travel / The first year…. This post is 365 days in the making. One year ago yesterday, I started Taylor Takes a Taste. Most people do a yearly recap around January 1st, so I realize I am a little late. Like companies who’s fiscal year begins and ends in June, the Taylor Takes a Taste year begins and ends on January 16th. There are so many different ways I could have gone in summarizing the last 365 days, but here is how I decided to do it. Thank you for checking the blog out! This blog is dedicated to my mission to travel,taste and photograph amazing food that this country has to offer. I am a wedding photographer out of Charlotte,NC, with a serious addiction to food. I am interested in all things food. Where does it come from? How is it made? Foods that are special to a certain area, festivals about food. If it involves food and traveling to find food then I am going to share with you what I discover. If there is something in your home town that is an undiscovered secret please email me and tell me about it. I am always looking for new culinary treasures. It is going to be an exciting adventure! Please subscribe by email so I can keep you up to date with what I discover! Thank you again for your time and I hope you will come back soon! Enjoy! When I wrote this 365 days ago, there is no way I could have foreseen where the year would take me. I should start of my explaining what I was thinking when I started this adventure a year ago. After moving back from California, I started out as a wedding photographer. To pass the time in between trying to book weddings, I started a Food Friday section of my blog. The idea was that every Friday I would do a food related post. Food Friday got me in the habit of posting something new every week and pushing myself to come up with interesting food related content. What I learned from these posts was that food was/is/and will forever be what I am most passionate about. After reading Gary Vaynerchuk’s Crush It and watching the movie Julie and Julia, I had an epiphany. Food is what I loved, so why am I giving up on it before I really ever gave it a chance? Screw it, I am starting a food blog. On January 16th, 2010 that is what I did. I started Taylor Takes a Taste. The focus was to be on traveling and food. Traveling and eating is what I did. Over the last 365 days I have eaten at over 100 restaurants in 22 different states. I thought it would be easiest to recap the year going month by month highlighting the major trips I took along the way. My first trip was to a wedding photography convention in Nashville, TN with a stop in Knoxville along the way. Here, I discovered an Elvis Panini, a bacon old fashioned, pancakes, Blue velvet cupcakes and some great sushi. The month ended with a trip to Charleston for one large Oyster festival. This month included trips to Oxford, MS and Savannah, GA as well as some recipe development of my own. In April, I traveled to Austin, TX where I spent an amazing week eating all the BBQ and tex mex I could find. In May, I stayed close to home working on recipes of my own and went to festival with my three favorite things. I did find time to visit the only Tea Garden in North America. July was another month full of traveling. I ate my way through the NC Triangle before heading out on Cross country drive. With an Old College roommate I drove from Madison, WI to Pasadena, CA, and then flew up to Berkeley, CA. On this Great Western Road Trip (Part 1, Part 2) I ate in Iowa City, Lincoln, Fort Collins,Laramie, Salt Lake City, Las Vegas, and Santa Barbara. In August, I spent an amazing weekend in Vermont at Good Commons for a farm to table weekend. This was another month full of tailgating. Starting in Dallas, I then went to Washington, Tennessee and Florida. The final month of tailgating. Starting in Baton Rouge, I then went to Auburn followed by Alabama and finally ending in Columbus, OH. After tailgating for 3 straight months I needed a break. I took a week off and spent the majority of my time working on the Tailgating book proposal. What a year. I started with no real idea of what I wanted to achieve and 194 posts later I have achieved more than I ever could have imagined! Every day I tried to step out of my comfort zone and try something new. I learned more than I ever could have imagined. In writing this post, I have taken the time to sit down and look back at all I have done in the last 365 days. If my blog was a person they would by far be the one I spend the most time with. We have had many late nights together (its 3 am now as I am writing this) and I am sure those late night dates will continue in year two. With all of the time that I spend writing, editing, researching and shooting the content you see here, it is easy to forget to take the time to step back and reflect and say thank you. Thank you to everyone who has made this possible. Those who have dined with me and held a reflector, eaten at 4 or 5 restaurants in a row, been a hand model and holding some type of food. Letting me take a picture of your order before you eat it, let me crash on your sofa, let a complete stranger take pictures of your tailgate, reading my posts, leaving comments, emailing me that you enjoy a post, providing suggestions of where I should eat next, and to everyone who has taken the time to look at what I am doing. I really appreciate it. What I have accomplished in the last year wouldn’t be possible with out your help. SO THANK YOU! That being said, I have a lot of great things in store for year number two! If the theme for year 1 was travel then the theme for year two is going to be at home. I will still travel as much as I can, but the travel funds of year 1 are no longer there. In year two I am going to get back into the kitchen and see what I can create. If I learned anything form year 1 is that I can only plan so much. I am not sure what year 2 holds, but I guarantee it will make you hungry. Thank you again to everyone who has made the last 365 days so amazing! « Beer bread, my favorite kind of bread..
Taylor I am so happy you had a great Year. Looking forward to reading all about 2011. Good Luck! Thanks Ben! Hope your trip is going well. Thanks so much for sharing and for making us smile, so glad I happened upon your blog and have enjoyed it immensely. Can’t wait to have as much fun in year two!!! Although it is very very bad to read at this time of night, your pix are so gorgeous and make me very very hungry now, must remember daytime views only! Thanks Cathy! I am sorry about the night time views! Thanks again for following along, I am excited for what is to come in Year 2! Thanks Erin! I am glad to hear you have enjoyed the posts. I am excited as well for what year 2 will bring! I have thoroughly enjoyed your Blog and look forward to Year Two!!! I’m an Ole Miss Rebel and we all loved that you came to Oxford. Come back anytime!! Thanks! Hopefully I will make it back to The Grove this year! Thanks Heather! I hope I can make it out to Boulder in 2011, so much great food there! 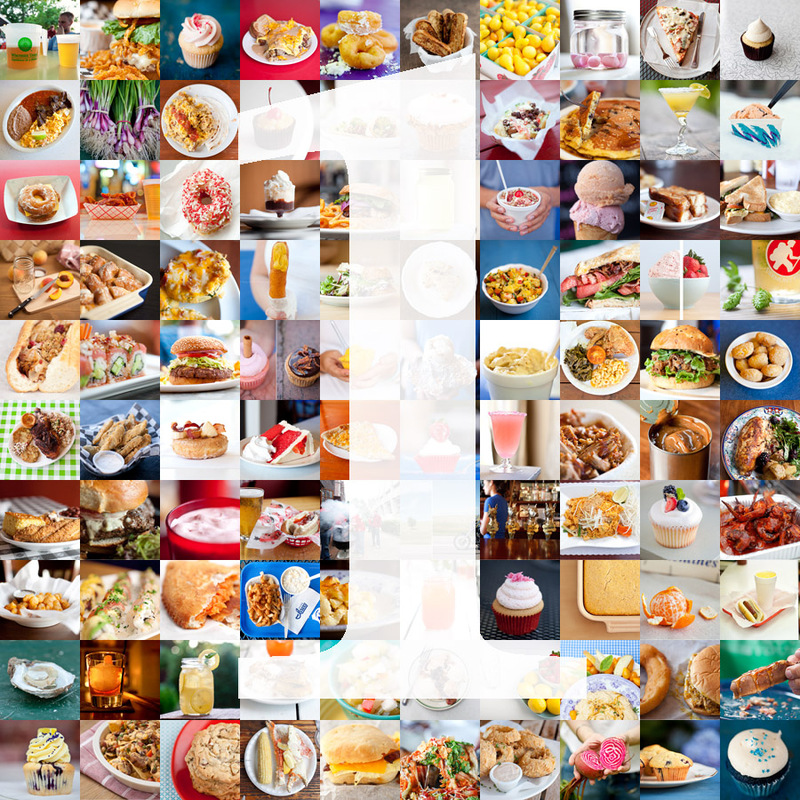 A year revolved around a LOT of delicious food. Looks fantastic! Thanks Samantha! It was definitely a delicious year! Thanks Lysha! I had a blast tailgating in Auburn, congrats on the Natl title! I really loved your food collage, it was truly a work of art! Great photography too – you should add more tutorials about how you take such great pictures, I know there are many people (like me) out there who are eager to learn from someone who has been to school for just that!!! Great job! Nice work man! As an Auburn alum I can honestly say you did a wonderful job of capturing the highlights of our tailgating scene. Thanks Michael! I had a blast in Auburn! Congrats on the great season! This is amazing taylor! wow your pictures are beautiful even the donut fried chicken sandwich looked goood. I have been wanting to travel to sonoma, tahoe, or san francisco to do some food shots. If you want to come up to northern california and go along with.. come!! have a happy 4th!